At the time of this photograph, George and Margaret Tester and their family were living along the Balcombe Lane at East Lodge, on the Handcross Park estate. 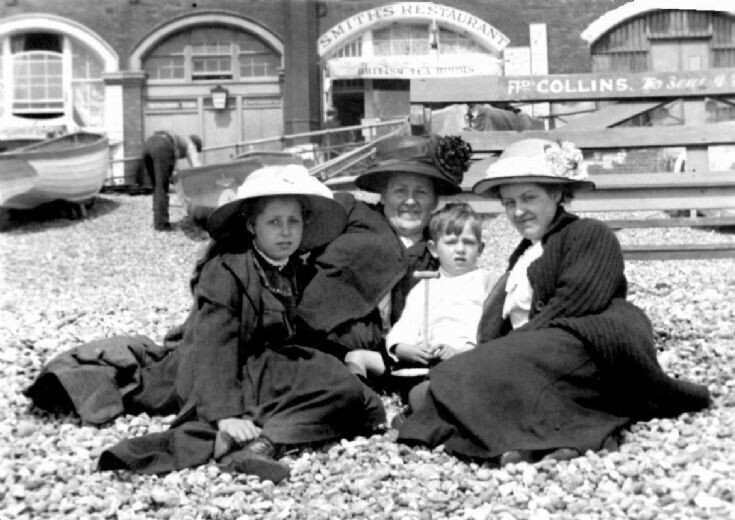 Margaret Tester (1865-1927) is second from left. Her children are Winifred Tester on the left, third is William “Pat” Tester (1906-1981), and on the right is Mabel Tester, later to marry Harry Field and live in their butcher’s shop opposite the Red Lion. The Large Version shows a close up. It seems to be a warm day at Brighton, but they are well protected from the sun! The hats worn by the ladies are quite splendid. Pat brought along his bucket and spade, and looks very cross at the lack of sand on Brighton beach! Select Open Document to view another family photograph from about 1904 showing the three daughters. It may have been taken at East Lodge, but it may not. On the left is Jeanie Lee Tester (1895-1971), on the chair is Winifred Tester (1900-1991), and on the right Mabel Tester (1890-1984).